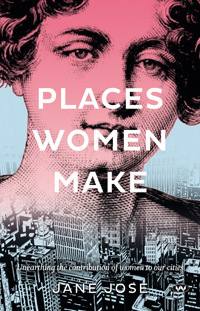 Places Women Make, Unearthing the contribution of women to our cities is an interesting book, one that will make most people reappraise their ideas about city design and architecture. Perhaps we don’t think much about the people behind our the buildings and city spaces, except of course for Jørn Utzon who designed the Sydney Opera House, or the Burley-Griffins who designed Canberra. (You can read my review of Grand Obsessions, a biography of the Griffins by Alasdair McGregor here). But Jose makes a strong case for looking closer at the shaping of our cities, rather than just at impressive buildings that attract our attention (and sometimes public scorn). Cities are much more than collections of buildings; they are places where people gather for art, culture and commerce. Cultural places are places we often visit alone but where we don’t feel alone. We share what we see and experience with others, and we feel a sense of belonging and connection, even if we don’t know or don’t talk to the others participating in the cultural event. Cultural places fulfil a need to gather, to share, to learn and to experience something unexpected, or beautiful, or challenging. In Sydney there are places which have endured and which have been loved by generations. Mrs Macquarie’s Road (sic) is a walk that remains a hugely popular destination. First created in the 1830s for the afternoon walk of Governor Lachlan Macquarie’s wife Elizabeth, it was a place to stroll in the cooling sea breezes. Still snaking around the glorious shaded edge of the harbour, it has become for people living in city apartments in the twenty-first century an exercise track or a beautiful path into the city; it is also a popular tourist mecca. The best cities can be walked, and have parks and paths where we can meander and experience a little connection to nature, even if it’s just blue sky and birdsong. (p.12). Although there have been women architects (often in husband-and-wife partnerships such as Penelope and Harry Seidler and Andrea and Lawrence Neild) women have tended to make more nebulous contributions to our urban spaces, which is perhaps why their role is often overlooked. In the early days of Australia, while women convicts did hard, backbreaking labour in domestic service and in vegetable gardens which helped to feed the colony, ‘gentlewomen’ were precluded from any kind of work – but they could use their influence. Caroline Chisholm, for instance, was an advocate for settlers’ land grants for farming. Lady Jane Franklin, wife of the Van Diemen’s Land colonial governor, created Australia’s first public botanic garden on 130 acres of land she had bought herself. Edna Walling is well-known as a landscape gardener, drawing inspiration from the bush and pioneering the nationalist movement for naturalistic planting. Jose gives examples of women as landscape architects and designers such as the American Kathryn Gustafson who designed the Diana Memorial. She quotes a number of them discussing the barriers to women working in the architecture of buildings and the lack of recognition when they do. However, (though the book is generally a bit Sydney-centric), the author introduces the architects and designers of places and spaces that are familiar to many people. Jane Irwin, for example, designed Little Beare Park while Sue Barnsley redesigned Prince Alfred Park, creating a native meadow, using wild grasslands as an under-planting below the towering Port Jackson fig tress that line the park’s edge. Sydney artist Janet Laurence worked with Badjala woman Fiona Foley to link the Museum of Sydney with the land and place outside in a work called The Edge of the Trees. Wendy Whitely and Gaye Porter are Sydney artists who have worked on lost, ugly or abandoned places and given them new life. Civic leader Jane Lomax Smith was instrumental in the naming of Adelaide’s parklands with Kaurna names as a symbolic act of reconciliation. In my city, Sunday Reed gave Melbourne her simple and now famous garden, Heide and Dame Margery Merlyn Myer DBE was the motivation behind the Myer Music Bowl. In Alice Springs, Olive Pink created the first botanic garden which is a place still used for sharing knowledge of the desert, bush tucker and the medicinal healing plants, and it is sacred land. Philanthropic women have made a huge contribution to the nation’s cultural life. Notable examples of women whose interest in the arts has prompted the development of galleries and cultural spaces include Janet Holmes à Court, Dame Elisabeth Murdoch, Dame Roma Mitchell and Yasuko Myer. Perhaps less well-known are Goldie Sternberg who donated her collection of Chinese art to the Art Gallery of NSW; and Ulrike Klein whose foundation funded a purpose-built concert space for chamber music just outside Adelaide. Women in administration who have made a difference include Kate Brennan, the first CEO of Melbourne’s Federation Square; and Joan Masterman who was the driving force of the Freycinet Walks and Friendly Beaches Lodge on the stunning east coast of Tasmania. And then there’s Tess Brady who was a key driver for the creation of Australia’s first book town: Clunes Booktown; and Stephanie Alexander who has been a huge influence on the community and school gardens movement. The last chapter focussing on heritage activists includes acknowledgement of Juanita Neilson whose disappearance and unsolved murder in Sydney was a catalyst for a whole movement; Wendy McCarthy who worked on the Bicentennial and then ran the NSW National Trust (the Trust itself started by Annie Wyatt in 1945); and Leckie Ord, the first female Lord Mayor of Melbourne, who was pivotal in introducing policies to protect heritage buildings. Our next Lord Mayor Winsome McCaughey was critical to the appointment of a great urban designer, Rob Adams, who reconceived Melbourne as a place of heritage streetscapes, small street blocks and laneways, which has transformed Melbourne’s CBD into a model city of liveability and a place designed for people. We may be tempted to take this for granted, until perhaps we visit other cities such as Amsterdam where no pedestrian can dawdle about and browse because cyclists rule the pavements. Interspersed among the stories of women’s contributions to our cities (some at greater length than others, especially Clover Moore, Lord Mayor of Sydney and Marion Mahoney-Griffin), there are vignettes of the author visiting these places and enjoying the ambience. This gives the work a personal touch, as does her own journey as an activist in Adelaide. Typo alert Lisa – Elizabeth Macquarie was long gone by the 1830s, the quote must refer to the 1810s. Thanks for the alert, but no, it’s not a typo (though I make them all the time, I admit, and am always grateful to be corrected). So… what’s the consequence of this? Is it the date of creation that’s wrong, or the attribution to Elizabeth that’s wrong? I’ve no idea – but EM definitely left NSW in 1822, never to return – she died in 1835. Maybe it’s like Mrs Macquarie’s Chair? Something that became associated with her after the event. I seem to remember that in Macquarie’s day, they were more interested in growing fresh vegetables than enjoying the gardens! I bet they were, given that starvation was never far away. Yet (assuming that Jose is in some way right about this path being conceived by or for Elizabeth Macquarie) even though it was only because of privilege that she – and Lady Jane Franklin too – had the leisure and sense of security to want approximations of British places to walk and relax, and they were probably resented at the time by the workers who had to actually develop them, nevertheless, their vision of a place of beauty amid the grim struggle for survival shows a creative imagination and a wish to transcend the harrowing existence that the colony was in those days.